* Fairfielders win rating events at Eastern Open. * 1/2 BILLION+ saw World Championships on TV ! the addition of more youth, first time visitors and out-of-town guests and family members. 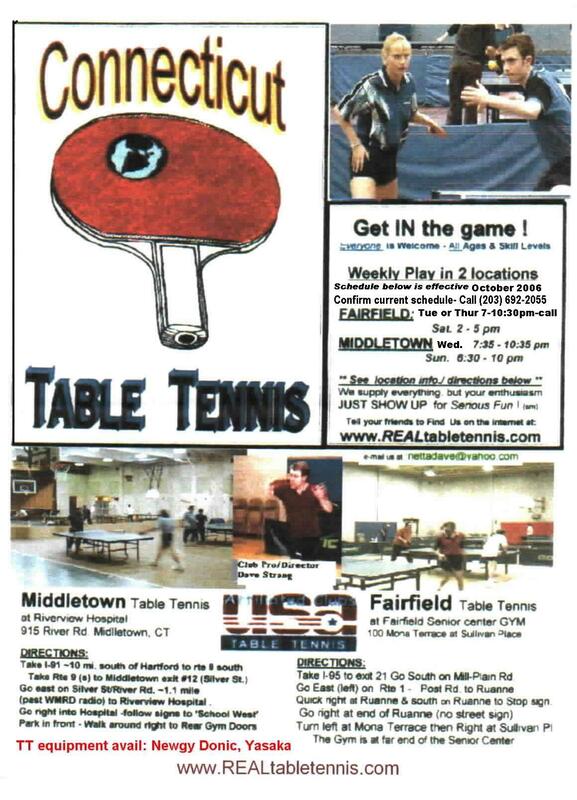 with almost as many players on Wednesdays in Middletown and Thursday nights in Fairfield. in January along with Thursday nights there and the Sundays and Wednesdays in Middletown. Please note the varying start times for all four weekly sessions. 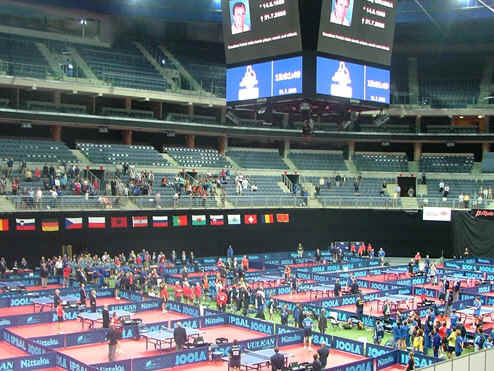 at one of the largest table tennis events in the world, the North American Team Championships. with nearly 1000 players on over 200 teams competing on 150 tables. Val Ort, Yong Mei Li and Inna Laskova. member ratings, but with initial matches allowing the team to move into a higher division. as linked at our ratings page - click on the player's name. we went ahead with those Middletown sessions. before coming out, particularly if you drive a distance to either club location. The last Sunday in September saw a promising start to Fall play in Middletown. or over 2300 playing matches for our entertainment and inspiration on center courts 1-4.
in the closest match of the night, deuce in the 5th game . Other match-ups saw Ernest Virgo also beat Dewitt as well as 2100 level Val Ort. atop the state list , as the only player rated over 2300, has seen radical change recently. simultaneously with long time CT#2 Rich Dewitt achieving his first 2300+ lifetime rating of 2305. But that only places Dewitt second again, this time to new Connecticut player Szymon Miczuga at 2322.
with Szymon were razor close Virgo wins earlier this year in Middletown. play with 2308 rated Dewitt.. This was a great event you'll want to see. See the Article on the event in the latest USATT Magazine or below on this newspage for more detail. a number of past regular players returning to active club play. Splitting close matches with Ct # 3 Rich Dewitt. the winter holidays and his father promises to play whenever he can in Middletown and Fairfield this Fall. Fairfielders win rating events at Eastern Open. rated event at the recent Eastern Open held at Rutgers defeating former new-Englander Ling-Ming-Chui..
And two other Fairfielders met in the finals of the U-1850 event. 'Gentleman' George Mikael 'defeated 'dangerous' Don Feltenberger in the 1850 event Finals. Congratulations to all three for a good tournament.. Currently Rich is one of only 4 players in Connecticut rated over 2200. 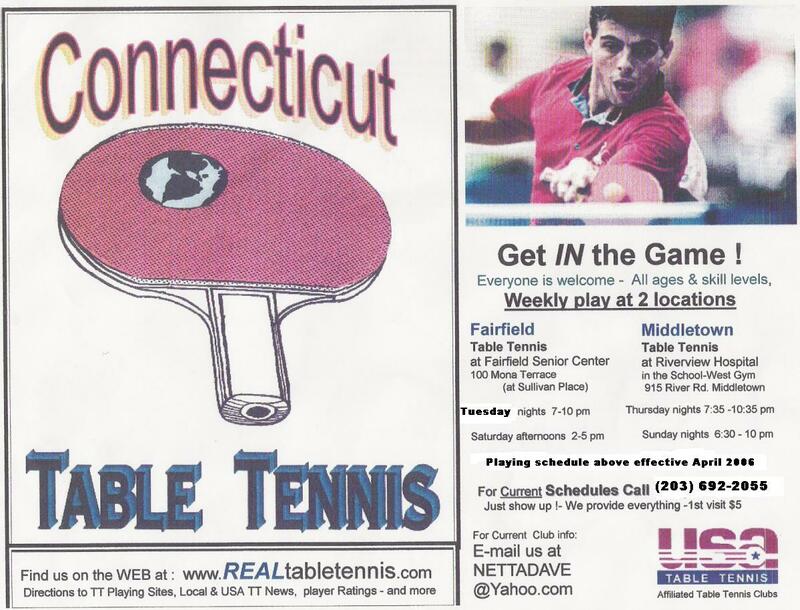 You don't have to travel to a tournament for some great table tennis matches in Connecticut. Players on recent July weekends saw interesting matches in Fairfield and Middletown. Connecticut's Dave Strang with a deuce in the 7th game battle in Fairfield early in the month. 2300+ rated Szymon Miczuga, in a match viewed with interest by a number of Middletown players. against CT. Club director Dave Strang. now twenty-something Brian was surprised this time by Strang after initially leading 2 games to 1.
catch another first in a decade re-match, this time against Virgo. Brian offered a rematch later in the evening, which he lost in an equally tight 7 gamer. tie-breaking match on some future weekend. 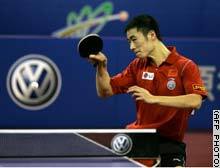 He took the title in an all-Korea final over teammate LEE Jung Woo . Oh reached the finals with a 1-4: 11-8, 4-11, 8-11, 8-11,9-11, win over Samsonov of Belarus. Fairfield club players Rich Dewitt, Cecilia G and Bob Kaufman attended the tournament. include 26 sports in the 2012 Olympics, awarded to London. both dropped from the games for 2012.
non-existent and growth in TV coverage were seen as a factors. 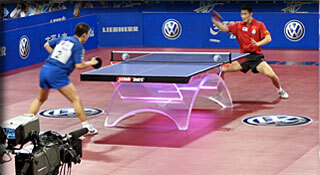 TT has been an Olympic sport since 1988. 1/2 BILLION watch 2005 World TT Championships on TV ! Television Audience for the 2005 World Championships was 532 Million viewers ! Continent-wide Eurosport's 16 hours of match coverage. Congratulations to Marilyn Feinstein of CT and her mother Thelma 'Tybie' Sommer. ('Tybie') Sommer in 80+ women's singles. Tybie was World Mix Doubles champ in 1948 ! Link to a Pittsburgh Newspaper feature on the pair. when they first met 30 years ago at a college table tennis 'club' at Kent State in Ohio. Since then Vernon has won at least 5 state championships in USATT/OTTA and Senior Games events. died ... at the age of 47 on Thursday. 11 medals at the European championship and 26 in the Polish championship. 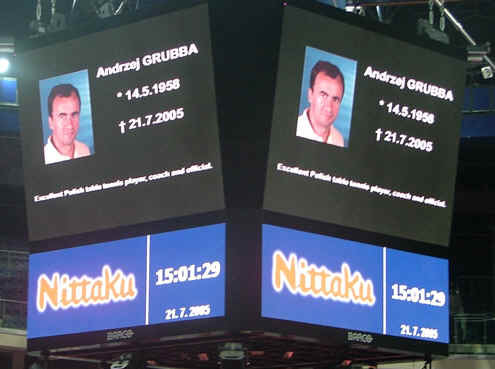 and is survived by his wife, a former Poland handball player, and two sons aged 14 and 20.
resulting in 25 players playing on 11 tables in Middletown. more play by school-aged and college players as their schools let out for the summer. playing for CCSU respectively in those sports. already beaten 3 of the top ten players in the state in club play. radio station doing sports and news on air. players pleasantly surprised at a cool reception on entering the gym. TTC playing site at the Fairfield Sr. Center Gym. interest in our 'cooler' game. very good lighting became even better - maybe the best lighting in the country..
level of brightness, even in the corners. shouldn't result in a  five minute wait for the lighting to reset. event held before, and during our regular Sunday night session in Middletown. (50-54) in his first year of eligibility. as CT state champions for 2005 joining previously crowned 40+ (and Open) champ Virgo. Castiglione and Weinberg teamed to win the doubles event. in the 2005 KILLERSPIN EXTREME MOHEGAN SUN CHAMPIONSHIP TOURNAMENT. 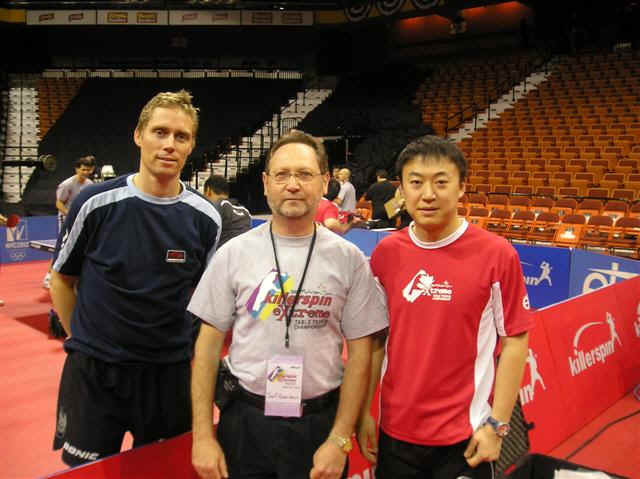 past world champions including Jorgen Persson and Jan-Ove Waldner of Sweden. programs later this summer on ESPN2 in the USA and on CCTV in China. SHANGHAI (AP) - They don't call it the national sport for nothing. Denmark and Hong Kong en route to all-Chinese finals Friday. to claim the only title to elude the Chinese at last year's Athens Olympics. Rich Dewitt of Fairfield in the finals. outlasted Inna Laskova of Branford 15-13 in the 7th to take the Class A U-2050 event. The two day event held at the Shelton Boys & Girls club drew 41 players. Under 15 1st David Katz 2nd Erik Joss. Under 21 1st Shreeniwas Dhond 2nd David Katz. Sunday evening session in Middletown. two years on the 'super' Sundays. over 1900 and  B and C 4 player groups of the next 8 players by rating. faced off in an exciting deuce in the seventh game battle for first. seventh game with an 11-9 win. be used for local Connecticut ratings. the football game, on a TV in a room adjacent to the Gym. CT Players win New England events / earn Iron man listings. earning him a photo on page 70 of the May/June USATT magazine. held December 5th in near Boston. Subhajit's photo was featured on page 66 of the USATT March/April Magazine. losses for a total of 208 tournament matches played. of 1400 to 2200 rated fanatics). and about 6 new/unrated players. Years day attracting 14 players. to follow club rules, and common sense, during our club sessions. considerate behavior in the Gyms. This allows everyone to maximize their enjoyment of our playing time. outside the playing area, especially in Fairfield's smaller gym. And don't hog tables or take 'winner's' on one table while playing on another. Be considerate of the club director. at the Gyms and surrounding premises. host facilities according to his agreements with them. For details go to the FAQ or rules pages. held in December in Las Vegas. Cheng is a fulltime coach in the Wash. DC. Cheng is also over 40 - hope for us middle-age players! such as Waldner, Kreanga, Kim Taek Soo and Primorac. Also a new series is expected in March or April. listings at ESPN.COM to confirm showing times. Please POST copies of this poster in places you work, shop, go to school etc. Copies are usually available from Dave at the club too. People often ask how we advertise the clubs. Newspaper and TV advertising costs thousands. too much for such an inexpensive sport. These posters and available bumper stickers and T-shirts are affordable ways to attract new players. 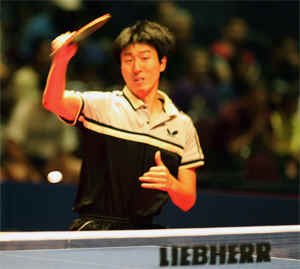 Celebrities playing TT " http://www.larrytt.com/celebrities_playing_tt/"
Donic, Yasaka Killerspin, ESPN etc.